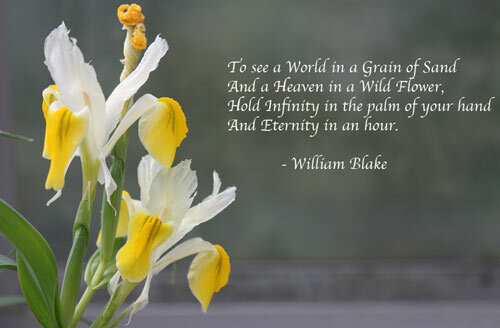 William Blake (1757 – 1827) – British mystical Poet.William Blake was a poet, artist, engraver and print-maker. Largely misunderstood during his lifetime, he is now regarded as one of the finest poets of the English language. His unique poetry encompassed a range of emotions and mystical under-currents, shaped by his vision and empathy for the world around him. His early poems Blake wrote at the age of 12. However, being early apprenticed to a manual occupation, journalistic-social career was not open to him. His first book of poems, POETICAL SKETCHES, appeared in 1783 and was followed by SONGS OF INNOCENCE(1789), and SONGS OF EXPERIENCE (1794). His most famous poem, ‘The Tyger’, was part of his Songs of Experience. Typical for Blake’s poems were long, flowing lines and violent energy, combined with aphoristic clarity and moments of lyric tenderness. In 1790 Blake engraved THE MARRIAGE OF HEAVEN AND HELL, a book of paradoxical aphorisms and his principal prose work. “If the doors of perception were cleansed everything would appear to man as it is, infinite.” (from The Marriage of Heaven and Hell) The work expressed Blake’s revolt against the established values of his time: “Prisons are built with stones of Law, brothels with bricks of Religion.” Radically he sided with the Satan in Milton’s Paradise Lost and attacked the conventional religious views in a series of aphorisms. But the poet’s life in the realms of images did not please his wife who once remarked: “I have very little of Mr. Blake’s company. He is always in Paradise.” Some of Blake’s contemporaries called him a harmless lunatic. The Blakes moved south of the Thames to Lambeth in 1790. During this time Blake began to work on his ‘prophetic books’, where he expressed his lifelong concern with the struggle of the soul to free its natural energies from reason and organized religion. He wrote AMERICA: A PROPHESY (1793), THE BOOK OF URIZEN (1794), and THE SONG OF LOS (1795). Blake hated the effects of the Industrial Revolution in England and looked forward to the establishment of a New Jerusalem “in England’s green and pleasant land.” Between 1804 and 1818 he produced an edition of his own poem JERUSALEM with 100 engravings. In 1800 Blake was taken up by the wealthy William Hayley, poet and patron of poets. The Blakes lived in Hayley’s house at Felpham in Sussex, staying there for three years. At Felpham Blake worked on MILTON: A POEM IN TWO BOOKS, TO JUSTIFY THE WAYS OF GOD TO MEN. It was finished and engraved between 1803 and 1808. In 1809 Blake had a commercially unsuccessful exhibition at the shop once owned by his brother. However, economic problems did not depress him, but he continued to produce energetically poems, aphorisms, and engravings. “The tigers of wrath are wiser than the horses of instruction,” he wrote.